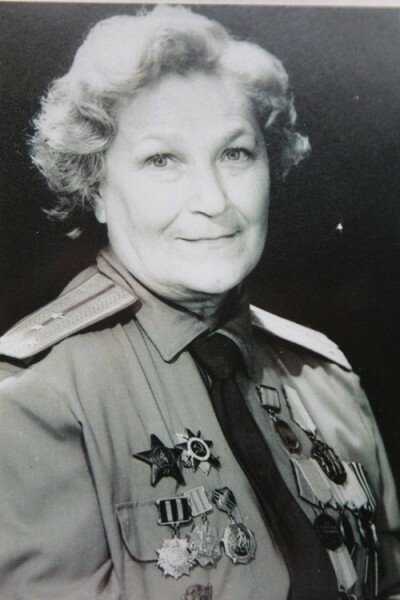 Major Nataliia Vladimirovna Malyshchev. She went to war as a third-year university student. Two weeks later her fiancé Mikhail was killed. 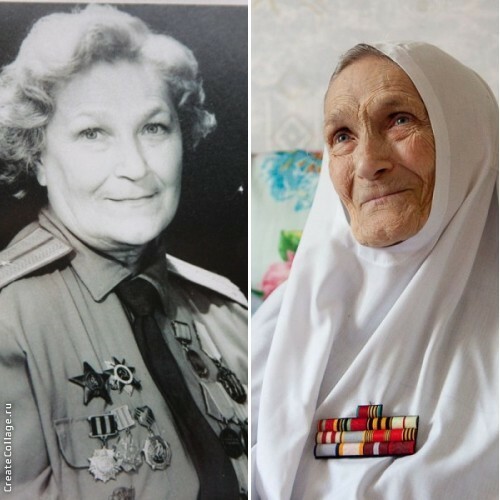 Throughout the whole course of the Great Patriotic War she served as a reconnaissance officer, worked in the headquarters of Marshal Rokossovskii, made it all the way to Berlin. When the war ended she resumed her studies graduating from the Moscow Aviation Institute; she then worked in the design bureau of S.P. Korolev. She retired early to take an active part in the rebuilding of the Moscow Metochion of the Puhtitsa Convent, and in the year 2000 was tonsured a nun with the name Adriana. 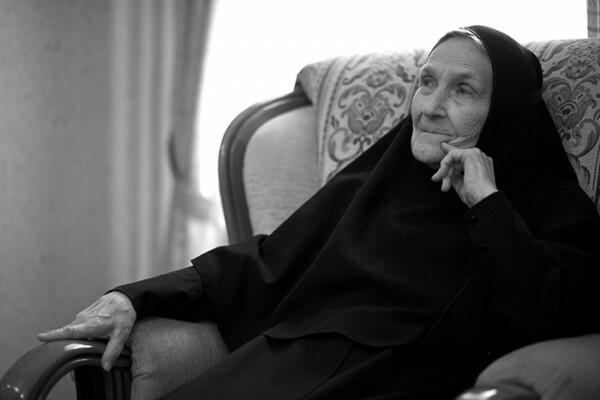 She died on February 4, 2012 at the age of ninety. Matushka really wanted to live long enough to see another Victory Day celebration. 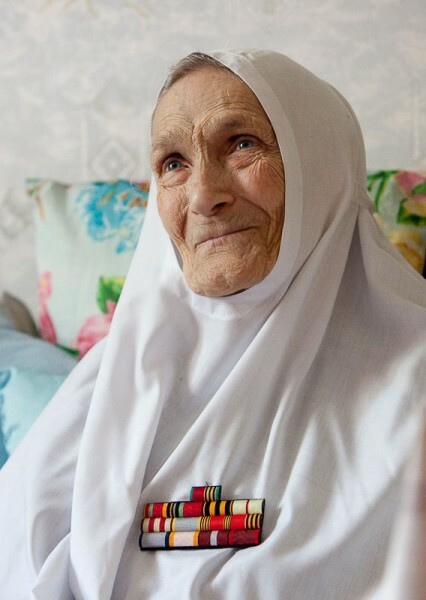 She was always really happy when people told her that her stories helped them remember the war and the great exploits of the Russian people during wartime years. 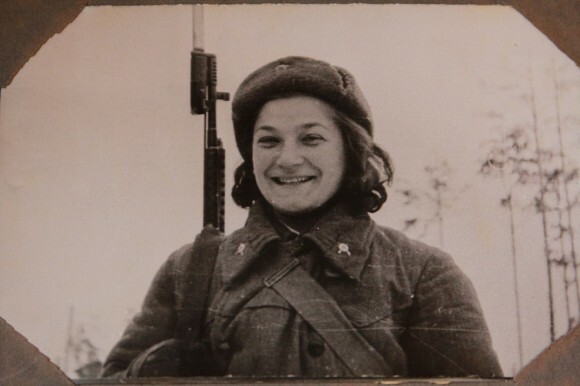 We offer our readers one of Matushka’s wonderful stories about the Great Patriotic War. It happened during the battle of Moscow. It seems I can still feel the anxiety everyone experienced during the first minutes of that uneasy wait, when our comrades left on reconnaissance. All of a sudden we heard shots. Then all went quiet again. And suddenly through the blizzard we descried a limping figure. It was Sasha, one of the comrades who had gone out on mission. He looked horrible – he had lost his hat and his face was contorted with pain. He told us they had run into Germans and that Iura, the other scout, was badly wounded in the leg. Sasha’s injuries were lighter, but he was unable to bring his comrade back. He had dragged him into a sheltered spot, but could barely make it back himself to report. We were petrified – how could we save Iura? To get to him you had to crawl through the snow without camouflage. I don’t know what happened but immediately I began taking off my outer garments until nothing was left except my warm white underwear. I grabbed the bag with an emergency kit, shoved a grenade inside my shirt (to avoid being taken prisoner), put my belt on, and rushed off retracing Sasha’s footprints. My comrades did not have time to stop me though they did try. – He is waiting for help, we cannot leave him there! – I spat out on the run as though obeying an urgent inner order, though all the while fear was constricting my heart. And he looked at me in such a way, there was such an expression in his eyes that I knew that if ever something similar happened I would go back again and again just to see that expression of gratitude and happiness in the eyes. We had to make it through this one spot that the Germans kept under constant fire. It would have been easy for me to crawl through it on my own, but how could both of us do it? One of Iura’s legs was mutilated, but his other leg and his arms were whole. I bandaged his leg, joined our belts, and asked him to assist me with his arms. We set off crawling back. All of a sudden, as if by request, it started snowing heavily just like in a play! The snowflakes were stuck together; they fell in clusters, and under this snowy cover we made it past the most dangerous spot. When we were halfway there, we were met by our friends. They lifted up Iura in their arms; but they had to drag me back as well as I had no strength left. During the battle of Kursk I was assigned to listen in on German telephone exchanges. A guide took me behind the enemy line. He had a map of wire communications. I connected, listened, and memorised anything important the German command communicated to their troops. I would then return and report everything I had heard to headquarters. Twice these operations were successful. But I will remember what happened on my third outing until my dying day. I had already disconnected and left my hide-out planning to start heading back as soon as it got dark, when I physically felt I was not alone. I turned around quickly pulling out my gun– the instructions were to commit suicide to avoid capture – and received a blow on the arm. The German in front of me had instantly grabbed my gun. I was frozen with fear: I would be taken to German headquarters. Please, Lord, anything but this! I didn’t even take a close look at that German. I was so frightened I could not distinguish his rank or his age. My heart beat really fast; I could hardly breathe. Suddenly, the German grabbed me by the arms and roughly turned my back towards him. “He’s going to shoot now,” I thought, almost relieved. Immediately I felt a hard shove in the back. Far ahead of me I saw my gun fall to the ground. I was stunned. When I turned I saw a tall figure retreating into the forest. – Don’t you understand that the Lord had been protecting you all that time and that someone had been praying really hard for you and for your deliverance? The frontline is not at all like people usually represent it. In reality it just does not exist. It is something visual. We used to define it ourselves: this is still our side; that’s already where the Germans are. We used to pick the most convenient places to get to our positions. We never knew exactly whether we had crossed the frontline or not; we used to guess based on certain markings. The war helped me understand many things. I realised that war is just like a photograph when it is developed. If a person has good inner qualities, they develop and can often be manifested in a heroic manner. Whereas, if there is something foul on the inside, these qualities eventually turn into something frightening.